The Prime SP-16 is an ultra-lightweight professional race suit from Sparco and is one of the lightest 3 layer suits currently available, weighing less than 240/270 gr/m2. Designed in collaboration with McLaren Mercedes the smallest weight saving details such as a lighter, slimmer zip, lighter wrists and ankles, neck and shoulders all help to reduce weight to ensure weight savings down to the very last gram. Ultra-thin stitching on all decorative items and thinner stitching on structural components with a flat stitching pattern. The Prime SP-16 racing suit features pre -curved arms, floating sleeves and stretch panels on the rear made from a light, breathable fabric. The outer layer is a double face mesh made from original DuPont Nomex comfort fabric which contains a high percentage of anti-static fibres which provide extremely efficient anti-static properties as well as breathability. With valuable experience gained from F1 an FHR device friendly shoulder epaulette is designed to reduce pressure during racing, with the integrated handles aiding extraction. Picture For Illustration Purposes Only. Our clearance stock is populated via an automated system so stock takes 24 hours to update. 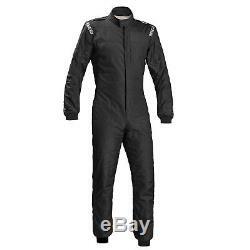 The item "Sparco Prime SP-16 3 Layer FIA Approved Race / Rally Suit Black Size 60" is in sale since Saturday, March 10, 2018. This item is in the category "Vehicle Parts & Accessories\Clothing, Helmets & Protection\Car & Kart Racewear\Race Suits". The seller is "demontweeksoutlet" and is located in Wrexham. This item can be shipped worldwide.